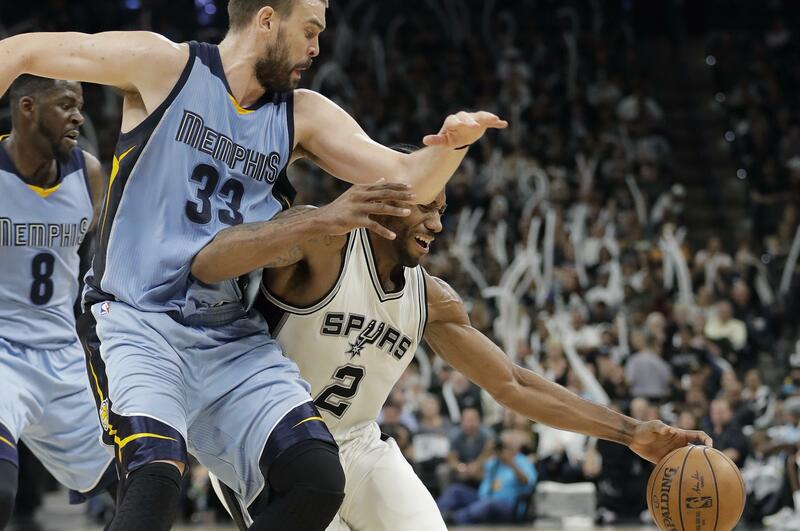 Mon., April 17, 2017, 9:36 p.m.
Kawhi Leonard had a postseason career-high 37 points and added 11 rebounds and the San Antonio Spurs beat the Memphis Grizzlies 96-82 on Monday night to take a 2-0 lead in their first-round series. San Antonio led for all but 13 seconds in winning its 10th consecutive postseason game over Memphis. Leonard finished the game 9 for 14 from the field and was 19 for 19 on free throws. Tony Parker added 15 points for the Spurs, who had three others score in double figures. Mike Conley scored 24 points, Zach Randolph had 18 points and Marc Gasol added 12 points for the Grizzlies. Game 3 is Thursday night in Memphis. Cavaliers 117, Pacers 111: Kyrie Irving scored 37 points, Kevin Love added 27 and the Cleveland defeated Indiana in Cleveland to take a 2-0 lead in their first-round playoff series. Paul George scored 32 and Jeff Teague 23 for Indiana which has a steep hill to climb to get back in the series. Cleveland is 12-0 when starting 2-0 in the postseason. Published: April 17, 2017, 9:36 p.m.